Economists overwhelmingly support free international trade. According to a 2006 Economists’ Voice survey, for example, 87% of economists polled agreed that “the U.S. should eliminate remaining tariffs and other barriers to trade.” Yet a vocal community of activists opposes globalization due to concerns that trade exploits workers and the environment in the developing world. In response to these concerns, Congress has recently taken steps to make pending trade agreements contingent on trading partners abiding by international labor and environmental standards. And while campaigning for the Democratic presidential nomination, both Hillary Clinton and Barack Obama called for reopening NAFTA negotiations in order to include more stringent environmental and labor rules. Whether these proposed policy changes are motivated by altruism or by more familiar protectionist arguments, the new restrictions are likely to increase production costs in developing countries, ultimately increasing the price U.S. consumers pay for imported goods. However, this welfare loss may be at least partially offset if Americans derive satisfaction from knowing that the imports they consume are produced in a safe, clean environment. In order to understand whether this proposed legislation is likely to have a positive net impact on American consumers, it is necessary to understand the premium they place on imported goods produced under stricter labor and environmental standards. A straightforward way to answer this question is to estimate the premium consumers are willing to pay for the “fair trade” designation. According to the Fairtrade Labelling Organizations International, producers of agricultural commodities who meet environmental and labor standards that are broadly similar to those policymakers are currently proposing are guaranteed a price “that covers the cost of sustainable production and living.” For example, as of December 2005 cocoa producers were guaranteed a price of either $1,750 per metric ton if the world price for similarly graded cocoa was at or below $1,600, or the world price plus $150 per metric if the world price exceeded $1,600. At the time this standard was implemented, the world price of cocoa was $1,519 per metric ton, according to the International Cocoa Organization. According to the Fairtrade Labelling Organizations International worldwide sales of fair trade goods increased by 41% in 2006 to $2 billion, making fair trade goods a small but rapidly growing segment of the larger market for “ethical goods.” TransFair USA, a California-based nonprofit that certifies fair trade food products in the United States, currently offers fair trade certification for coffee, tea, herbs, cocoa and chocolate, fresh fruit, sugar, rice, and vanilla. Loureiro and Lotade (2005) use contingent valuation techniques to estimate consumer willingness to pay for the fair trade designation. The authors find that 85% of consumers are willing to pay a positive premium for fair trade coffee, with the average consumer willing to pay 22¢ per pound more for fair trade coffee than for conventional coffee. However, contingent valuation studies may be vulnerable to hypothetical bias. Cummings, Harrison, and Rutström (1995), for example, find that fewer than 40% of participants who indicated that they would be willing to pay $3 for a calculator in a hypothetical market were actually willing to buy the calculator when real payment was required. List and Gallet’s (2001) review of 29 experimental valuation studies found that hypothetical willingness to pay estimates overstate real willingness to pay by roughly a factor of three. In this section we present the design and results of a nonhypothetical experimental auction comparing shoppers’ willingness to pay for conventional and fair trade food products. Lusk and Shogren (2007) provide an extensive review of the experimental auction literature and demonstrate that these controlled auctions are enormously useful in examining consumer preferences. Experimental auctions have, for example, been used to examine consumer preferences for food safety, meat tenderness, and genetic modification. To our knowledge, the results we present here are the first nonhypothetical estimate of consumer willingness to pay for fair trade goods. One hundred and twenty-two shoppers at two grocery stores in Harrisburg, Pa. participated in this study in October 2005. According to the market research firm Acxiom, Harrisburg is one of the twenty most demographically representative metro areas in the United States. Participants bid on a 2 lb. bunch of bananas, a 2 lb. bunch of fair trade bananas, a 3.5 oz. chocolate bar, and a 3.5 oz. fair trade chocolate bar using the Becker-DeGroot-Marshak auction mechanism which is widely used by economists for this type of research. For a more detailed presentation of the experimental design or participant characteristics, we refer the interested reader to Rousu and Corrigan (forthcoming). Participants in this type of auction submit their bids with the understanding that the selling price will be chosen at random. Anyone who submits a bid above this randomly determined price purchases the item at the random price. Anyone who submits a bid below this price purchases nothing. Because the price participants pay if they win the auction is not influenced by the bid they submit, there is no incentive for participants to understate their true willingness to pay. After collecting the first set of bids, the experimenter presented participants with objective information about fair trade certification. The exact information presented to participants is shown in the sidebar to the right. Participants then submitted another set of four bids. Participants understood that only one of the bidding opportunities would be binding and that bidding opportunity would be determined randomly at the end of the experiment. After the bids were collected and the binding bid and the selling price were randomly determined, participants completed a brief exit survey. They were then paid $10 for participating in the study, and any transactions agreed to were carried out. Because we are primarily interested in the premium consumers are willing to pay for stricter environmental and labor standards, we focus on bids submitted after participants received objective information about the fair trade designation. We estimate the fair trade premium by taking the difference between bids submitted for the fair trade and conventional versions of a product. 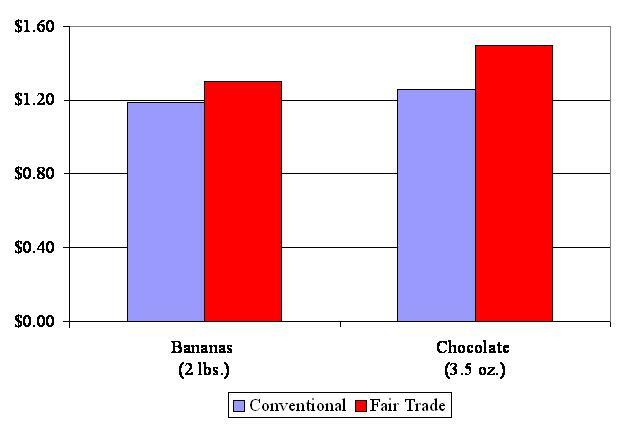 We found that the median fair trade premium was zero for both bananas and chocolate, suggesting that the typical Harrisburg shopper places no value on the fair trade designation. However, the mean fair trade premium was positive for both goods. Specifically, participants were, on average, willing to pay an 11¢ premium for fair trade bananas and a 24¢ premium for fair trade chocolate. The mean bids submitted by participants are shown in Figure 1. Taken as a whole, these results suggest that the mean fair trade premium is driven by a minority of consumers who place a relatively high value on the fair trade designation. For example, one in ten participants was willing to pay at least a 50¢ premium for fair trade bananas or at least a $1.25 premium for fair trade chocolate. Congress would like our trading partners to abide by stricter labor and environmental standards. In cases where these standards impose a binding constraint on foreign producers, the associated increase in production costs is equivalent to a nontariff barrier to trade. Other examples of nontariff barriers include voluntary export restrictions in the automobile industry, agricultural price supports, and restrictions on U.S. gamblers limiting their access to foreign online gambling sites. Basic economic theory predicts that these kinds of restrictions benefit domestic producers who compete directly with the affected foreign firms, while simultaneously reducing consumer surplus. The net effect is a decrease in domestic welfare. However, if domestic consumers prefer goods produced under stricter environmental and labor standards, the “warm glow” they receive from consuming such goods may offset the lost consumer surplus to such an extent as to make the imposition of stricter standards welfare enhancing for society. Our results show that while the typical grocery shopper in a representative U.S. city derives no value from the fair trade designation—and, by extension, the stricter environmental and labor standards that go with it—a minority of shoppers place substantial value on that designation. Under the current market–based system of optional fair trade labeling, individuals who derive added value from consuming goods produced in a clean, safe environment are free to buy fair trade products. Imposing stricter environmental and labor standards on all imports is likely to increase the prices consumers pay, but it is unlikely to generate enough of a “warm glow” to offset this price increase given that the consumers who place the highest value on these stricter standards have presumably already embraced fair trade certification. Therefore, we conclude that current market–based practices are preferable to rewriting trade agreements. Cummings, R., G. Harrison, E. Rutström. (1995). Homegrown Values and Hypothetical Surveys: Is the Dichotomous Choice Approach Incentive Compatible? American Economic Review, 85,260-66. List, J., C. Gallet. (2001). What Experimental Protocol Influence Disparities between Actual and Hypothetical Stated Values? Environmental and Resource Economics 20,241-54. Loureiro, M., J. Lotade. (2005). Do Fair Trade and Eco-labels in Coffee Wake Up the Consumer Conscience? Ecological Economics 53,129-38. Lusk, J.L., J.F. Shogren. (2007). Experimental Auctions: Methods and Applications in Economic and Marketing Research. Cambridge, UK: Cambridge University Press. Rousu, M.C., J.R. Corrigan. (forthcoming). Estimating the Welfare Loss to Consumers when Food Labels do not Adequately Inform: An Application to Fair Trade Certification. Journal of Agricultural and Food Industrial Organization. The fair trade movement promotes international labor, environmental, and social standards. The movement focuses on exports from poorer countries such as Ecuador and Ghana to richer countries such as the United States. Standards may be voluntarily adhered to by importing firms, or enforced by governments. 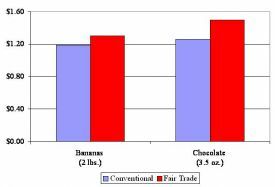 Proposed and practiced fair trade policies vary widely, but most often take the form of minimum price support schemes for products such as bananas, cocoa, and coffee. Non-government organizations also play a role in promoting fair trade standards by serving as independent monitors of compliance with fair trade labeling requirements. Matthew C. Rousu is Assistant Professor (rousu@susqu.edu), Department of Economics, Susquehanna University, Selinsgrove, Pa. Jay R. Corrigan is Assistant Professor (Corrigan@Kenyon.edu), Kenyon College, Gambier, Ohio.